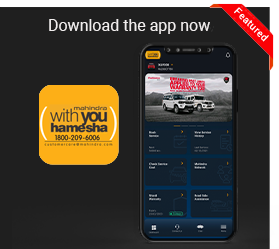 Dear Customer, Now getting next day appointment is possible on "With You Hamesha"
A single interface to find a variety of services to help you care for your beloved Mahindra vehicle. Get a glimpse of all that you need to know in one view such as renewal reminders, current servicing status, alerts, vehicle information and vehicle valuation. Moreover, we tell you when is your next service due and what all needs attention to get your car to be road ready! Now Booking a service is at your fingertips. It provides you seamless service booking experience with service center locators, pick up options, slot confirmation, E-job card, tracking status of various stages of the vehicle servicing process and transaction history. ï¿½Shieldï¿½ is our optional extended warranty scheme which you can buy online that covers unforeseen mechanical and electrical breakdown. This program is specially designed to give you Extended benefits, Extended satisfaction and a higher resale value for your vehicle. 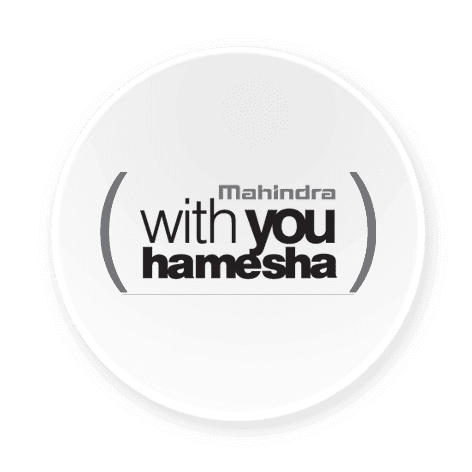 Mahindra is indeed With You Hamesha! Now you can have the luxury to be at home or office and pay online without any hassles! With ample payment options and complete Invoice job card get your car delivered at your doorstep! Pick n Drop is a unique service offered by Mahindra With You Hamesha which allows Mahindra customers to have their vehicle picked up from their doorstep and dropped back after the vehicle service is complete. Mahindra offers a unique express service offering, "Mahindra QWIK" to compliment your busy schedule. Applicable for select scheduled maintenance service, routine jobs like oil changes, select jobs, mechanical and electrical checks & adjustments and washing of the vehicle. Exclusive and dedicated QWIK Bays having requisite special tools and equipment and manned by specially trained technicians. Available in select outlets with prior appointment. Please check with your local dealer for more details. A first of its kind initiative in the auto industry, Door Step Service redefines customer convenience by offering to do service at your door step ï¿½ be it your home or your office. Applicable for select periodic maintenance service including oil change, minor repairs, adjustments and washing* of the vehicle. Specially designed Door Step Service Van is equipped with all the required tools and equipment, Mahindra genuine parts, portable gen set, etc. to meet all the requirements. Carried out by Mahindra-trained technicians. Applicable for Nuvosport, KUV ,TUV300, XUV500, Verito Vibe, Scoprio, Rexton, Quanto, Xylo, Bolero, Thar, Marazzo, Alturas G4 & XUV300. M-Plus is a unique customer care innovation driving a positive change in the ownership experience of our customers. 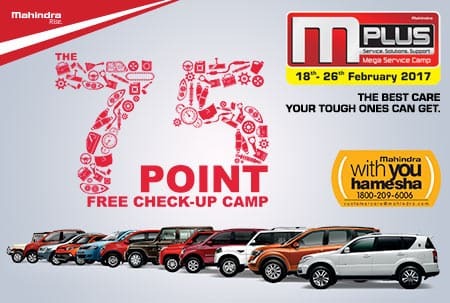 M-Plus encompasses host of value added service offerings available during various service camps organised by Mahindra dealers throughout the year. Currently, the following service camps are organised under M-Plus. 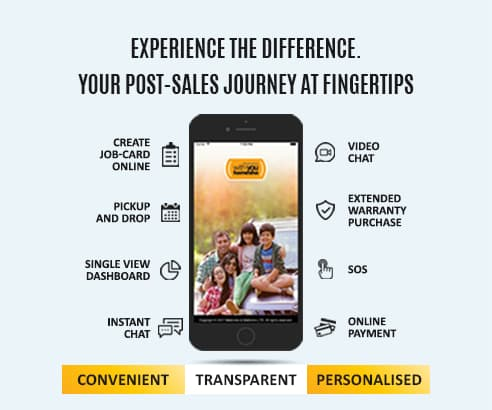 Pick n Drop is a unique service offered where your Mahindra vehicle is picked up from your place (home or office), taken to our dealer workshop for service & repair, and dropped back to your place after service. By opting for Pick n Drop, you can avoid the hassle of travelling to the workshop, thereby saving your valuable time. This service is currently available in select cities at a nominal cost. Please call your nearest Mahindra dealer for more information. Mahindra Road Side Assistance Program is a 24x7 emergency support provided in the event your Mahindra vehicle is immobilised due to any mechanical or electrical or accidental breakdown and the vehicle may not be in a position to be driven to your home, or the destination, or to the nearest dealer workshop. Mahindra Road Side Assistance Program is available round the clock and aims to ensure that you have a pleasurable journey virtually anywhere in India without any worry, in case the vehicle becomes immobilised due to any reason. 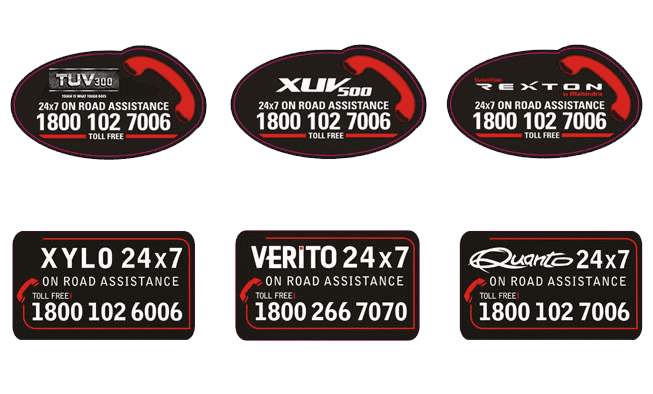 The 24 x 7 Road Side Assistance Program covers various services such as wheel change, fuel delivery up to 5 litres, taxi co-ordination, handling key lock-out situations, minor on-spot repairs that may be attended on-site and towing your vehicle to the nearest Mahindra workshop in cases of an accident or breakdown. Assistance is never out of bounds with Mahindra Road Side Assistance Program. The 24 x 7 Road side Assistance is available up to a distance of 100 kilometer from the nearest Mahindra authorized workshop for the particular model. Mahindra Mobile Seva is an exclusive service offered for customers of Mahindra Alfa, Mahindra Gio, Mahindra Maxximo,Mahindra Pick Up and Mahindra Imperio which lets them book a service for their vehicles near their workplace. Mahindra Mobile Seva is a service offered for vehicle that have a fixed route journey. An exclusive door step service for Mahindra Jeeto, Supro, Alfa and Maxximo customers. Avail this unique service in your stand at your convenience. Saves you fuel cost and time as the service is provided on your daily route at no extra charges. Helps to keep your vehicle road-worthy all the time and enables more profits in your business by reducing vehicle down time. Manned by Specially trained technicians. Currently available on select towns. Contact your nearest Mahindra Dealer for more details. As I went through your letter welcoming me to the World of exclusive privileges at Purple Club, I was delighted to know that my wonderful experience of buying an XUV 500 is going to get even better as I go ahead. It's been only six days since I got the 'Cheetah' home but I have already got addicted to its power packed drive, so much so, that I eagerly look forward to the long morning and evening drives to and from office.Let me put on record my appreciation for the entire Engineering team at M&M for designing and manufacturing a World Class product, at home, in India. I would also like to extend my thanks to your dealer Synergy Cars (Konecpt) at Safdarjung Enclave, Delhi, for being there with me at every step right from the test drive to the final delivery including pre-booking, loan documentation and everything else. My Sales Advisor, Mr. Mohit Wason and the head of sales Mr. Bhupesh Masta stood true to every single word they had promised and took utmost care to ensure that my XUV buying experience is unmatched. Whether it was picking my family for a test drive or ensuring that the vehicle is delivered to me on the date and time promised, every single thing was handled smoothly and perfectly. I was heartened when Mr. Masta ensured that I get exactly the same carpet mats and accessories that I had requested for and when Mr. Wason took a de-tour to deliver the car body cover at my residence in the cold Delhi evening. Even when the formal sale was over and I made a casual visit to the Synergy showroom on a Saturday evening to deliver some documents, Mr. Masta got a complimentary car wash arranged for my new XUV while I sat back and enjoyed Synergy Cars hospitality and a cup of hot coffee. It's not often that you get the best of both worlds, a great car and a perfect buying experience!! My good wishes to M&M, Synergy Cars, Delhi and its caring Sales team. May you all have a great 2015 ahead!! ï¿½ Very good vehicle condition checking & advice. Overall I would say this team and its leader (Mr. Ashish) could be used for training examples in any other service station. Thanks to Indifferent Indian Railway's Mahindra Xylo Gain ! It is with great pleasure and pride for me to inform you that I along with my friends have just come back from an amazing driving adventure of about 6000 kms in 15 days travelling from Pune to Leh (Vis the Rohtang Pass), Khardungla, Pangong, Kargil, Shrinagar, and back to Pune in my Mahindra XUV 500 (W8 2WD). The experience of driving the XUV through one of the most tough terrains, at altitudes of over 18000 feet, was an unforgettable and an experience of a lifetime. The performance of the XUV was excellent. Not a single problem throughout the 6000 kms, except for a little loss of power, which I attribute to the lack of oxygen at those heights, the vehicle performed to perfection. I am really impressed with the performance of the vehicle. My special thanks to Ms. Aditi Kher, Mr Tiwary, and Mr Jagdeesh Nanda of Silver Jubilee Motors, Pune, who took special care and serviced the vehicle pre and post the tour, and made sure that the vehicle was ready to take on the ardous journey. I would also like to thank Ms Shama, and the service team of M/s Swami Automobiles, Chandigadh, who made special arrangements to get my vehicle washed and cleaned, even though it was very late in the evening. A big thank you to Mr Manish of the Mahindra Service station at Leh, who checked the vehicle at Leh and assured me that nothing was wrong with the vehicle, when I was a little apprehensive about the loss of power. A special mention for Mr Sachin Bahl, (Manager R & D Engines Mahindra) with whom I had a chance meeting at the Mahindra Service station at Leh. In-depth discussions with him led to a lot of clarification as regards the XUV's performance. Just to let you know that it was a thrilling feeling to receive my new Opulent Purple XUV W8 FWD. I was very excited when I drove the cheetah out and we all loved the XUV, the colour, engine and of course the majestic drive !! And the majesty of the XUV is complimented by the excellent support and welcome we had at Anantcars, Bannerghatta road branch. Even though it was a Christmas holiday, they made feel so special during the handover ceremony, entire family was overwhelmed. The season's cake was icing on the joy !!. It was the best handover ceremony I had attended so far.. Special mention to Sales advisor Dinesh who patiently helped me right from test drive to on-time delivery all through last 5 months clearing my queries, multiple visits and unexpected delays from my side. Special thanks to him for all the help in clearing the documentations for loan and registration during my overseas travels. So does finance team ( Mahadeva and Jagdish) who helped to clear the loan in unbelievable speed. Special thanks to Anant cars team for all the help in getting all the things done without any hitch and minimum involvement from me. Yes, my rating on this experience in 10/10. 10th,May,2014 was as usual yet another agonizing wait this year too for our railway tickets to our hometown to get confirmed. We had booked tickets for Kerala as per earliest booking date falling 2 months back. However even after all that pain, Indian Railways still chooses to keep itï¿½s users hanging by their teeth even at the last moment. The IRCTC screen was screaming stillï¿½.WL1 (Waiting List 1)ï¿½and thatï¿½s how it was even a week prior to that. Clock struck 9 pmï¿½.I decided to give Indian Railways the royal kick!!! Cancelled all onward and return tickets toKerala and decided to ride the chariotï¿½..my XYLO. It was a split decision and was welcomed by all at home, and the next day we were on the road at 9 am heading towards Kerala. We took the Mumbai-Pune-Kolhapur-Bangalore-Salem-Coimbatore-Palakkad-Wadakancherry route to reach our destination Kuttancherry in Kerala. We broke our journey at Bangalore for the night and headed for Kerala around noon to reach our final destination by 9pm the second day. Now coming to the scorching 1500km traversed across 3 states in 2 days on our Mahindra Xylo was simply ï¿½driving blissï¿½. The sights and sounds experienced along the way were unparalleled only next to walking. Even sitting in the comfort of a AC Railway coach, you donï¿½t get the pleasure of watching our beautiful country that close. Also you rule the roadï¿½so you decide where to stopï¿½for even just gazing around. All this a far cry from being just another railway passenger being towed away by a silly engine across the landscape. Further in Kerala, we decided to stay a few nights in forest cottages at Rippon in Wyanad district famous for itï¿½s lush greenery and wildlife. Again our Xylo effortlessly traversed north Kerala into Calicut and then uphill on to the Wyanad hill range. Other than gorging into luscious ï¿½Kozhikodan Chicken Biriyaniï¿½ and fish enroute at select hotels, we wound our way several hairpin bends and found our way on to Rippon mount by evening. Our decline into the forest cottages was a sheer drop of mother earth at around 45 degrees downwardsï¿½something that I was unsure whether our Xylo would do. Our path was blinded by thick fog/mist and depreciating light, and the road was as good as a river bed. Again Xylo did the trick to its perfection and we reached safely amongst excited hotel staff who welcomed us with a special lookï¿½.WHY?.. That was the first day, after many many months fog/mist decided to descend on the forest cottage resort. Back at Kochi after few days, we were joined by my uncle and aunty. During our stay there, a chance visit to south Indiaï¿½s largest mall, LULU MALL with my uncle and aunt in our Xylo brought out a sudden decision. My uncle who is Retd from the Armed Forces was suitably impressed in that ride that he came up with the suggestion of whether he could join us back to Mumbai on our Xylo. For me it was a YES-YES-YES all the way. Next day, by 12pm we were cruising out of Kochi towards Trichur- Palakkad- Coimbatore-Salem and finally reached Bangalore by 11pm after mandatory ï¿½bladder breaksï¿½/ ï¿½chai breaksï¿½ enroute. Our journey was smooth except for the fact that the roof carrier started to come off itï¿½s moorings, and hence our luggage on top was precariously perched, so much so that I had to take a call to repair the same immediately or drive slower. As time was not on our side, we decided the latter. However, not once during these tense moments did our braveheart ï¿½Xyloï¿½ give up. Slowly but surely it ensured that we all had a comfortable ride. A quick nap of 8 hours at Bangalore at our friendï¿½s place was enough for us to get back on the road towards Mumbai. Following the same path of Hosur- Nipani- Kolhapur we cruised slow and steadily to reach Nipani around 7.30pm. After a nice dinner there, we decided to skip Kolhapur halt and move on the same night towards Mumbai. This was one stretch, I must say again our Xylo did not ditch me considering the poorly lit national highway, and very few pit stops, we cruised along gingerly to reach Pune by 3.30am. A quick refuel and some garam masala chai was enough for both mind and machine to get back to the last leg ï¿½..onward MUMMMMBBBAAAAI. Surprisingly the Pune Expressway was crowded than normal with huge trucks and buses, hence our descent to Mumbai was slower than normal. We finally touched base at Goregaon at my brotherï¿½s place at 6 am to wish him Good Morning!!! I have to admit that all this was not possible, had it not been for our braveheart Mahindra Xylo. Jokes apart, I never had to open the bonnet even once anywhere along the 3500km traversed across four states. Further not a single puncture and no overheating or AC issues. All this I can attribute to the loving care this Xylo has got from few good men and women from G3MOTORS at Malad and Mira Road. Santosh Rajane and Priyesh needs a special mention for their timely support to the vehicle whenever the same came in for servicing. Both have been empathetic to my needs and have always the suggested the best for me and the vehicle. Other names that I can recollect are Ganesh Shetty, Chetan, Amol, Kavita, Sudheer, Vijaya . I wish them and your team as a whole to greater success in making such braveheart chariots like the Xylo fromMAHINDRA more endearing to families like us. Right from first day i.e. 28 May 2013, when for the first time I contacted your ï¿½Customer careï¿½ it had been exceptional, effortless experience and ï¿½The Big Thank Effectï¿½ every day. I wish to extend my sincere gratitude to you, Mr K S Jamwal (Asstt GM ,Lohari Motors Pvt Ltd, Jammu) and his complete team for the outstanding dedication to customer service .I must acknowledge that you guys have acted with the highest amount of professionalism, and hospitability. This combined with courtesy, and diligence warranted my experience to be placed on records. I was always a ï¿½proud ownerï¿½ of ï¿½SCORPIOï¿½ but now ï¿½delighted ownerï¿½. Commitment to great customer service is to be commended and I am hopeful you will share this letter with all concern in management. God bless you guys and keep up with the great work. First of all, a big THANK YOU for you and your team who have extended their support to me on this Sunday 11-Aug-2013. As I was getting ready to go back to Bangalore from my small home town called Koovappally, my scorpio KA03-MC-7785 has other ideas. Fan belt came off! When I checked with others, it appears like the water body ball bearings are damaged and needs replacement. On a Sunday morning in Kerala, it is not likely that you will find staff to attend repairs. I was worried about my kids who has to attend classes next day, leave alone my office on Monday. Many different thoughts came up. Should I book a flight and travel ? In the mean time, my brother knew a common friend who is having Scorpio. I contacted him for some help, and immediately he returned the call asking me to contact you with the details. I was pleasantly surprised with your cooperation to extend the support and organize the support staff including possible replacement materials. Team Nattakom reached my place as promised. Mr Dinu and Mr. Tijith attended the vehicle, while I continue to enjoy the Sunday monsoon rain. By evening, team completed the repair and I was ready for my return trip. We did a 10 hrs nonstop journey back to Bangalore and reached safely in the early hours. My kids had a good sleep during the journey and left for school, just like another Monday morning! Thank you once again to you and Team Nattakom for the timely support. Much appreciated. Please pass my regards to Tijith and Dino for the good work done. Recently on the 10th of July 2013 I had the opportunity to visit your service centre at Raey Road once more. Some minor irritants with the car's computer systems , tyre pressure and wipers was giving me trouble and I needed to get them fixed straight away as I was travelling to Pune on the 12th . On calling the service centre I was told that I could come the very next day if it was urgent . I agreed and arrived 10th morning at 9.30 or so in pouring rain and black gloomy skies. I must admit I was unsure of what service I could get in such weather. To my surprise I was greeted by Mohammed Shaikh your service advisor who listened to me patiently and extremely politely and listed all my cars problems. He promised that The urgent ones would be attended to immediately . A young mechanic from the floor ( Imran ), was assigned to the car, assisted by another young person, Kazi from the tyre department. All in all It was a very pleasant experience . I sat in the guest room and was given hot tea and breakfast ,which too was served to me by polite lads with a warm smile . That Hot tea and sandwiches in pouring rain was like Gods gift to me . I would like to thank your canteen boys for their hospitality. Every time I visited the car these two boys were hard at work and by early afternoon they had finished everything . Minutes later I had a bill and gate pass in my hand and was through . Kudos to your service center. Its back to the efficiency that I once knew and as a customer I truly wish it stays this way always. Thank you Mohammed for being so professionally efficient and Imran and Kazi for a wonderful job done .They all contributed in providing me a truly pleasant visit. This is Email to convey my special thanks to your team at Caravel Motors, Vadodara for rendering their assistance to take my XUV 500 which was very badly stuck in a mud pit at a very odd hour. I had gone to meet my friend who was unwell since couple of days and local Municipal Authorities had dug the road for some drainage related problem near his residence. The Authorities just dumped lose soil in which my XUV 500 was stuck at around 7.30pm the night of 29th, August 2014. Immediately I called Caravel Motors (Mahindra & Mahindra Dealers) and with a span of 40 minutes the team was present and help me out. Please convey my special thanks & gratitude to Mr. Pradip Parmar (Head Services), Mr. Krunal Panchal (Relationship Manager), Mr. Mayur Solanki (Co-Tek) & Mr. Pankaj Parmar (Break down Team). I had ensured that I note the name & their designation so that this could be conveyed to you in a proper manner. Dear Mahindra Team ï¿½ This is to pass my sincere appreciation to Mr. Raghu who heads the SKS Automobiles Body Shop in Salem District, Tamil Nadu. I had dropped my Scorpio CAR (Reg No:- KA 51 MB ï¿½ 5662, Model ï¿½ Scorpio SLE) after a complete front damage (Claim#1-278E2EG with IFFCO)on last month 15th July 2014. From this date and till now MR. Raghu is in touch with me always and provided a complete update happening towards repair of my CAR which was really commendable and these updates were assured me my car is in a safe hand of Mr. Raghu and taken me to carry out my regular office work without any other thoughts in my mind. He had also updated me every now and then how Mr. Raghuï¿½s Team in their Body Workshop overcoming the technical issues happening in the CAR in very much regular interval which is really appreciable. Mr. Raghu is one of the kind person whom I met who does not carry any high profile with him and work on the ground to solve the customer problem and always be on top the activities happening on the ground level. I still remember my entire family was in panic mode when the accident was happened on 15th July 2014 where Mr. Raghu was on call with me and explaining very gentle about the way forward and bring the CAR back to SKS Auto Mobiles Body Work Shop in Salem. At that crucial time factor with the panic accident, his very polite guidance had helped us a lot. Happy to meet you Mr. Raghu and Thanks for all your ground work and made my CAR back to Normal state.. Wish you All the Best and Keep do such good work always in your carrier and life.. I recently got the last free service from VVC motors in Hyderabad. The service person who handled me for this was Arafath. He was courteous and helped me to get the vehicle back on time the same day. I would like to give a very special commendation to Ms. Vanaja who is the Customer Service manager for VVC motors. I have had some issues earlier in the past with regards to my Scorpio and I would like to put this on record that Vanaja is an extremely customer oriented person and really goes out of the way to ensure Customer Satisfaction. At times, when VVC motors procedures were rigid, Vanaja demonstrated flexibility and went out of the way to help me out. She is truly an asset to VVC motors and I wonï¿½t blink an eyelid if I get a chance to bring her on board in my team! She is ever helpful, always pleasant, calm and composed and manages tricky situations very well indeed. She makes sure that a problem is resolved by looking at alternatives and options. She also ensures close-looping and has always kept me updated on the progress of the resolution of an issue. Please do let her supervisor know how good she is towards Customer Service and how she helps in retaining Mahindra customers. Thanks! It has been a particularly expensive time for service, given that my xylo is about 4.5 years old. But nevertheless the following points stand out. 1. Ravi's very responsive , respectful and friendly attitude on phone, anytime of day even after office hours is great! In the past I know when other service advisors will never even return missed calls in Saligramam. 4.The post service feedback seeking is prompt and detailed, not just a tick in the box. 5. Overall there are times when I am too bored to empty valuables, and leave CD's, documents etc as-is when there is a minor repair for 1-2 hrs. I am thankful that none of my belongings are even touched! You have a truly honest workforce. I wish to place on record my appreciation for the way my complaint was dealt with and fixed. My Scorpio developed a problem with the airconditioner. I called Reegan your service advisor and informed him of the problem and the urgency since I am planning to go out of station with the car. He requested me to come to the garage and had the car checked and informed me that the motor for the blower was stuck. It was decided that the only course of action was to replace the blower and assembly. He arranged this immediately and the car was delivered to me in about an hours time, and within the estimate given to me. This is the sort of service that I expect from your company, and must give credit to Reegan for his handling the matter. I had taken my XUV car for monsoon service on August 2nd, 2014. The service advisor Gopal at Sri Durga Auto at Mayapuri always attends to my car. Would like to put on record his services which are always delightful. His personal attention to details are really commendable. This is not the first time but it is always consistent and same. This is one reason that I always check before if he is available and take my car. He is quite knowledgeable and gives solution to every problem. Thank you Gopal for the excellent services provided by you always. It is time we put in another word of appreciation about the excellent service rendered to us by Mahindra (TVS iyengar and sons, Trivandrum). We picked up our Quanto on 17th Nov 2012. Over the one and a half years of our association with Mahindra, we've been constantly amazed by the outstanding service offered to us by the company. Starting from Mr Rajkumar whom we dealt with till the vehicle was picked up from the showroom to Mr Vidhu and Mr Nandagopan who has been handling the after-sales services, we would say the staff are simply the best. The service requests are always promptly attended to, by Vidhu. We've, so far, not had to mention an issue twice to Vidhu as he has always noted and corrected everything on time. Moreover, he always follows up after the service to ensure that all issues have been fixed satisfactorily. Mr Nandagopan is the one who has been picking up and dropping back our vehicle so far and he has been prompt and courteous as well. He takes note of the issues as well and promptly passes it on to the concerned people. It also needs to be mentioned that Mr Vidhu and Mr Nandagopan are easily accessible over their mobile numbers, almost always. We've been left wondering about why we were dissuaded from buying a Mahindra vehicle by so many, with reference to the service. We've found nothing to complain about so far. To cut it short, we're overwhelmed by the service rendered to us by Mr Rajkumar, Mr Vidhu and Mr Nandagopan of Mahindra, Trivandrum and are going to definitely spread the word against the negative public opinion about Mahindra after-sales service. . I would like to thank Mr. Anil, Service Advisor, VVC Motors and Mahindra team in providing service for my vehicle, Mahindra Scorpio, on 18th April 2014. All the complaints were addressed and the vehicle is running very smooth. Right from booking an appointment for the service to the time I came out of the service center after servicing was exceptional and the team did a fabulous job. The follow-up and reception from VVC Motors staff was very good and cordial. I own a Mahindra vehicle for almost 3 years now and the kind of attention I get from the staff at VVC Motors these past 2 servicing is really outstanding. The complaints that I had with the vehicle was noted down well and a technician was also assigned to do a Test Drive to better understand the complaints. The estimate provided was pretty close to the actuals. Interior and exterior cleaning was done neatly. The vehicle was handed over on time. In fact, I was very happy with the service advisor in explaining me the issue and the solution for each of them. With this satisfaction I can very well recommend VVC Motors to anyone in future. A very BIG THANK YOU to Mr. Anil Kumar and the team of technicians, support staff, front office that worked on my Vehicle and giving me a brilliant experience. I am a proud owner of XUV 500 W8, I would like to inform you that your XUV has become a true companion for me and my family, whenever I drop in at Kolkata Mohan motor workshop, the place becomes " a home away from home". Needless to say, they have been providing warm hospitality and adequate attention for maintaining my vehicle. I feel proud to get associated to Kolkata Mohan motors which justifies the tag line of your esteemed company "With You Hamesha".A special thanks to Mr. Abhishek Banerjee, Service Manager Hi- end and Ms Rima Patra, Relationship Manager, both of them have become part of my extended family.Wishing all the best to Mahindra and Mohan Motors. I am Prof. Vipinendran K, a very satisfied customer of your service center. This is the first time I have serviced my Quanto (4th service - paid service) at the Zulaikha Motors Pvt. Ltd. Keelkatalai, Chennai service center. I had done the initial 3 free services with their Ambattur centre. The vehicle has run around 1000km after the service and I am very happy with its performance till date. I am delighted to see Zuliakha Motors and Mahindra taking a lot of effort and doing a lot of hard work to satisfy the customer. Wish you and your entire service team all the very best in all your endeavors. I would like to take a min here and want to provide a very satisfactory feedback on Mahindra with you Hamesha App. I own an XUV 500 W10 and I use this app from day one without any issues.This Application has all details for owner or to the User whilst it eases out all the worries of going to the service station or dialling to the service station toll free number for service appointments or to check the bill status or service history etc. This well-developed app has all the necessary required information from the end user for their use. There are lots other options as well which can be accessed through the app like set the reminders, service notes, track and payment, Mahindra network, direction to the workshop, feed-back. It doesn't stop there, it even provides application tour for understanding the app. The best option is SOS which is very much needed at the time of vehicle break down. I would like to appreciate the team who has developed this application without any flaws and making the Users day with delight. Mahindra Team is playing a major role to get their standard widened in all the aspect and nothing less to compete with the global competitors!! Kudos Team !! Keep up the good work. Wanted to share my recent experience during and post my Scorpio servicing. On the eventful day of 3rd January, a mob violence broke out in Mumbai and my car was severely damaged during this fight between different factions. I called the insurance company (ICICI Lombard). They got me in touch with G3 Motors (Mira Road); their partners. I had all the apprehensions on how this will be taken care of/ how much do I need to shell out/ whether work will be done in a timely manner in a professional way. Must say, I was up for a surprise. The driver from G3 came on time and noted down everything. All the documents were collected properly. Once the car was in the workshop, Nishant called me and explained various damages and need for repair/ replacement. He used to update me on the status of the vehicle every 2nd/ 3rd day. During further inspection, Nishant realized that there are a few more damages that weren't seen at the first instance and he called up ICICI person and got that done as well. When I went to the workshop to collect the vehicle, was so very impressed. They hadn't only took care of the entire body-shop work, their attitude towards me was also truly professional. Overall it was a real pleasure knowing Nishant and Sharad. While the experience of my car getting damaged is quite traumatic, thanks to these guys - the end wasn't. Performing scheduled maintenance at recommended intervals is the key to getting the most of your vehicle while ensuring vehicle longevity. Hereï¿½s a checklist of how to keep your car looking new inside out. Educating the girl child for a brighter tomorrow. Anand Mahindra founded Nanhi Kali in 1996 out of the conviction that empowering women through education would have a tremendous positive impact on the nation in the long run. Girlsï¿½ education correlates with a reduction in child and maternal mortality, improvements in child nutrition and health, lower fertility rates, better economic production, and female empowerment. Weï¿½re here to help you create a better world. We see our role as a major corporation both in India and in the world as an incredible opportunity to lead businesses towards sustainability. Sustainability encompasses not only the conservation of our environment, but also a responsibility to every stakeholderï¿½not only our shareholders, employees, and customers, but also the communities we impact and the suppliers we source from. Anand Mahindra founded Nanhi Kali in 1996 out of the conviction that empowering women through education would have a tremendous positive impact on the nation in the long run. Girlsï¿½ education correlates with a reduction in child and maternal mortality, improvements in child nutrition and health, lower fertility rates, better economic production, and female empowerment. Through Nanhi Kali, Mahindra hopes to play a small but significant role in shaping Indiaï¿½s future by empowering girls through education. Jointly managed in partnership with the Naandi Foundation, Nanhi Kali is the flagship program of the KC Mahindra Education Trust. We select students based on multiple criteria, then create a comprehensive sponsorship to address both learning and financial challenges. We offer academic support classes to help students master math, science, and language concepts, and we defray the hidden costs of education, including uniforms, school bags, clothes, shoes, and more. Individual or corporate donors sponsor each girl and receive regular progress reports in return, helping to promote understanding and empathy. Sponsorship is only USD 60 for a student in grades 1-5 and USD 90 for a student in grades 6-10. The Mahindra Group independently supports the education of 29,100 of the 75,000 underprivileged girl children who participate in Project Nanhi Kali. Within the period of a single year, third party assessments have indicated an improvement in learning outcomes ranging from 40 percent in tribal Chhattisgarh to 78 percent in Mumbai. 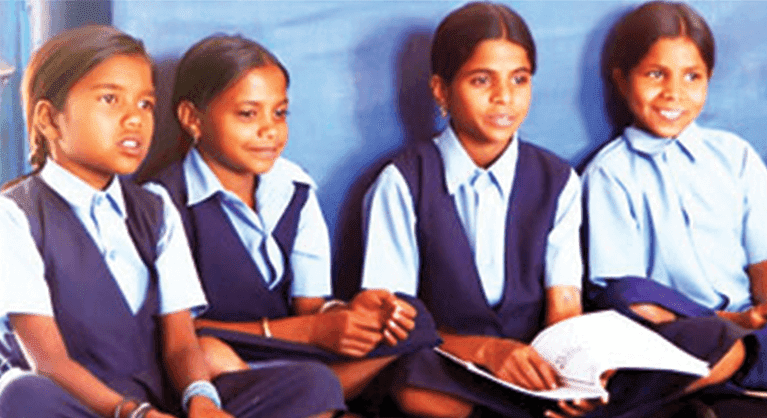 By March 2013, Nanhi Kali aims to provide educational support to 100,000 girls from poor urban, remote rural and conflict-afflicted tribal communities across nine states. An unique platform for change-makers. Spark the Rise is a unique online platform for change-makers across India to connect with one another, collaborate and exchange ideas, procure volunteers and donors, and to compete for monthly grants from Mahindra. 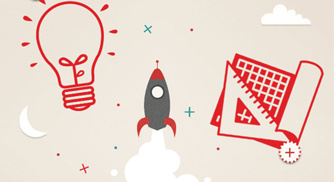 Submit a ï¿½Sparkï¿½ ï¿½ a Project or Idea that aims to drive positive change ï¿½ and work with the Spark the Rise community to make it a reality! OK I GET IT. STOP SHOWING THIS BANNER TO ME.